Lock in a great price for Minerva Guest House – rated 8.6 by recent guests! Margaret the proprietor was such a lovely lady and was very friendly and welcoming . The place was so close to everything . Fantastic location and views . Our room was perfect and our twin beds were really comfy . All the staff were really nice and very polite. We loved it there and will return in the near future. The property is being renovated and we had a brand new family room. Lots of space, privacy from the children’s beds, a fantastic waterfall and jet shower, new furniture and fresh paint. The staff, Margaret especially went out of her way to show us around and make us feel comfortable. The full English breakfast in the morning was delicious and set us up for the day. 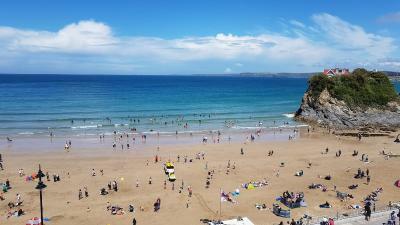 The views of Towan beach are amazing. Will be coming back in the near future! Excellent b And b, friendly owners and property fully refurbished to a high standard. Really lovely room, great bed, nice and quiet. Location was brilliant, great sea view. Superb breakfast, served in lovely surroundings. Minerva Guest House This rating is a reflection of how the property compares to the industry standard when it comes to price, facilities and services available. It's based on a self-evaluation by the property. Use this rating to help choose your stay! One of our best sellers in Newquay! Less than a 2-minute stroll from the beach, Minerva Guest House offers free WiFi, a bar and a games room with a billiards table and dart board. 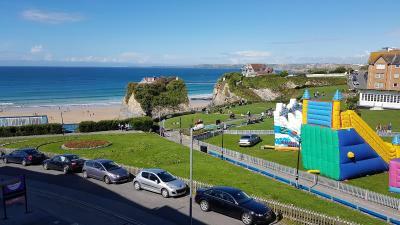 Located in the seaside town of Newquay, the property is surrounded by shops and restaurants. Blue Reef Aquarium is 3 minutes' walk away. Inside, the rooms each feature a flat-screen TV and there is also an electric kettle. The private bathroom comes with a shower. Extras include ironing facilities. At Minerva Guest House, the bar offers a selection of beers, wines and spirits. Other facilities offered at the property include a shared lounge. 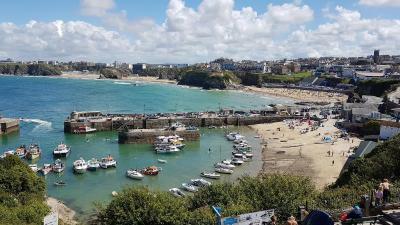 Newquay Activity Center is just a 2-minute walk away, and you can enjoy water sports including surfing, kayaking, canoeing and stand up paddle boarding. 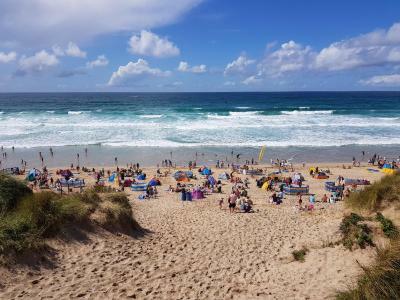 The property is 10 minutes' stroll from Newquay Train Station, 16 minutes' walk from Fistral Beach and less than a mile from Newquay Zoo. When would you like to stay at Minerva Guest House? This double room has a flat-screen TV and there is also an electric kettle. The private bathroom comes with a shower. Extras include ironing facilities. This family room has a flat-screen TV and there is also an electric kettle. The private bathroom comes with a shower. Extras include ironing facilities. This family room features a flat-screen TV and there is also an electric kettle. The private bathroom comes with a shower. Extras include ironing facilities. This double room features a flat-screen TV and there is also an electric kettle. The private bathroom comes with a shower. Extras include ironing facilities. This single room has a electric kettle, flat-screen TV and tumble dryer. This family room has a tumble dryer and electric kettle. House Rules Minerva Guest House takes special requests – add in the next step! Minerva Guest House accepts these cards and reserves the right to temporarily hold an amount prior to arrival. Please note that there is no parking onsite. Free on street parking is available opposite the property, and there is a paid car park, just a 5-minute walk from the property. We couldn’t get parked on the property drive but saying that there are 5 spaces and free road parking if a space comes available. How close the hotel was to the beach. The view was amazing. Room colder than I would like but there is a refurbishment going on so this will be resolved no doubt. The cauple who run the business are the main source, friendly and warm. They spend time to explain everything with the smile on the face. Amazing location overlooking the sea. 1min walk to the beach and same to the town centre, where there is loads of places to eat or have a drink. Very comfortable and extremely clean rooms plus fantastic breakfast. Excellent location, the owners were extremely friendly and helpful. We arrived slightly earlier but were checked in straight away and upgraded to a sea view room. The room was lovely and spacious, and the bathroom was spotless. Margaret gave us some great advice on places to go during our stay and recommended a great pub with live music. Breakfast was included the next morning - a great selection and we enjoyed the fry up! Would definitely stay again!